Growing herbs for cooking is another gardening project that yields plenty of satisfaction. 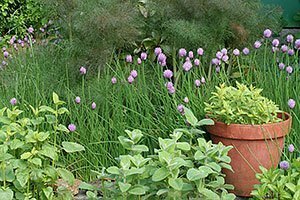 Herbs thrive with just a small amount of care, and they do well in small spaces and growing in pots. Most herb plants come from Mediterranean regions and they thrive in summer’s heat and sun. They are attractive and can take a bit of dryness in stride, which makes them a good choice for containers. Many herbs mix well with other annuals and perennials, so you can tuck them into your flower garden. Give herbs well-drained soil and full sun (six hours daily). Water your plant well to get them established. Although most herbs don’t need much watering through the season, don’t neglect them in times of drought. Most herb plants thrive in dry soil, but some types, mint, for example, prefer moist soil. Once herbs are established, regular pruning promotes lush new growth – which has the best flavour – but avoid removing too many leaves or stems at one time. The plants need leaves to grow and thrive, so keep about 6 inches (15 cm) of growth intact. The best way to harvest herbs is to snip a portion with sharp scissors or pruners. Avoid tearing or pulling branches and stems off. Pulling can injure or even dislodge roots. Herbs have few insect and disease problems, and most types grow best in average garden soil, rarely needing added fertilizer. Annuals such as dill, chervil and cilantro are easy to grow from seed, and ready for harvesting several weeks or a couple of months after sowing. You can buy them as transplants, but for most types, you will get stronger, bushier annual herbs if you grow them from seed. However, basil is an exception – it grows very well from transplants. Annual herbs flower and go to seed quickly, and then their leaves tend to lose flavour. For a fresh supply, replant every 3 weeks into early or mid August. To harvest, snip off leaves, or pull the entire plant. Classic perennial kitchen herbs such as French tarragon, chives, sage or thyme, are all available as transplants. While you could try to grow some of them from seed, it’s generally not worth it. The reason: it takes more than a season to get most perennial herbs to grow big enough from seed for a decent harvest. When you buy perennial herbs as transplants, allow them to become established in your garden for a month or two before you start to harvest their leaves and stems.